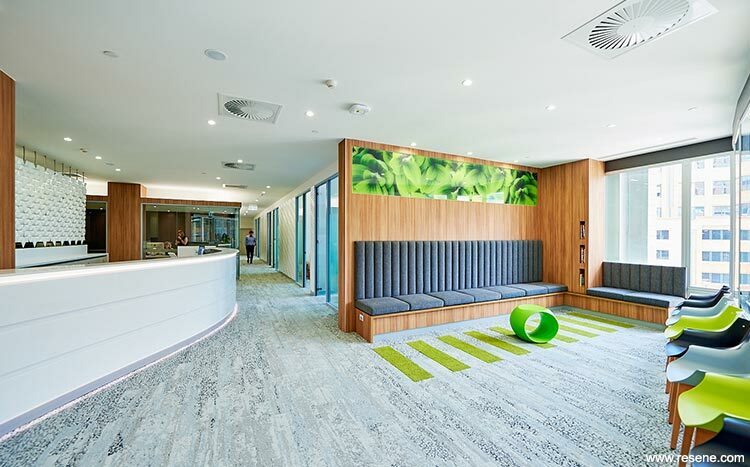 The Brisbane Clinical Neuroscience Centre (BCNC) project is a flagship private practice reinvigorating the empty floors of the old Mater Children’s Hospital. The collaborative efforts of a practice manager, interior designer and commercial builder have delivered a visually beautiful, contemporary workplace which enhances the experience for patients and staff. The brief was to merge three medical practices – a neurosurgery group, a neurologist and an otorhinolarynologist – enabling the medical practitioners to function collaboratively, yet independently. The challenge for KoDesigned was to create an interior that would energise staff yet provide a reassuring environment for patients. In anticipating the future direction of medical practice, spatial planning included procedural rooms, large collaborative zones and smaller spaces for telemedicine or independent work. All areas are designed to serve a multifunctional purpose. The focus of the design placed equal consideration on the needs of practitioners, staff and patients. Materials were selected for their longevity, trend-resistance and several textural elements were used as art enhanced by the Resene colour selections. The Pinterest savvy client and designer drew global inspiration. A three dimensional wall extends the full length of the patient corridor, forming an optical illusion and encouraging touch. A screen installation, the focal point behind the reception, is manipulated to create patterns. Humour is evident as colour blocks in staff corridors form a pedestrian crossing. Rainforest prints mounted in unexpected spaces and a green wall obscures the back of house from lunching workers. Primary direction for the interior selections was in direct contrast to the busy, visually uninteresting outlook that centred on the Mater Hill Busway. Strong connections to nature and texture were featured internally as a focus. The neutral Resene paint palette of Resene Half Truffle, Resene Quarter Truffle and Resene Eighth Truffle throughout with Resene Quarter Oilskin and Resene Ironsand in the Doctors’ lounge was selected for its direct relationship with the carpet tiles, taking from the horizontal organic element and lifting to the vertical. The relationship between the carpet and paint colours provided the anchor and was the inspiration for all other finishes and elements. 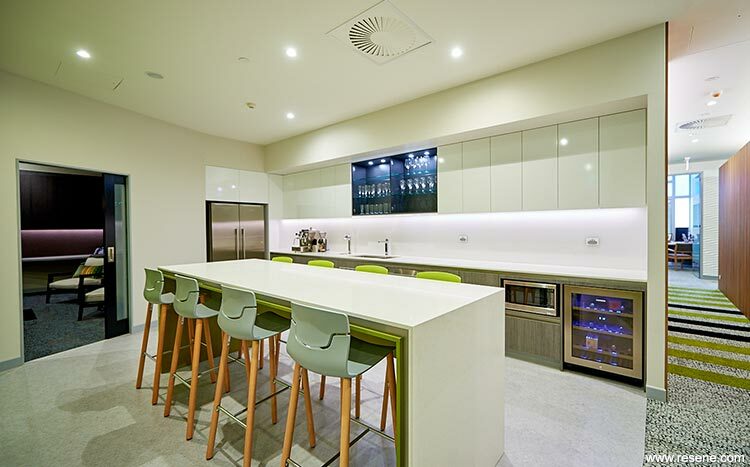 Large medical group practices are the modern trend, yet the challenge is to maximise the utilisation of the space to counteract the high rents of CBD areas and energy consumption. The BCNC project is an excellent example of maximising the space by designing multi-functional areas, which suit individual and group requirements, while allowing for growth of the business. The BCNC design has successfully created a community where staff love to come to work.